"New York Police Department" and "NYPD" redirect here. For other uses, see NYPD (disambiguation). The City of New York Police Department, more commonly known as the New York Police Department and its initials NYPD, is the primary law enforcement and investigation agency within the City of New York, New York in the United States. Established on May 23, 1845, the NYPD is one of the oldest police departments in the United States, and is the largest police force in the United States. The NYPD headquarters is at 1 Police Plaza, located on Park Row in Lower Manhattan across the street from City Hall. The department's mission is to "enforce the laws, preserve the peace, reduce fear, and provide for a safe environment." The NYPD's regulations are compiled in title 38 of the New York City Rules. The New York City Transit Police and New York City Housing Authority Police Department were fully integrated into the NYPD in 1995 by New York City Mayor Rudolph W. Giuliani. In June 2004, there were about 45,000 sworn officers plus several thousand civilian employees; in June 2005, the number of officers dropped to 35,000. As of December 2011, that figure increased slightly to over 36,600, helped by the graduation of a class of 1,500 from the New York City Police Academy. As of Fiscal Year 2018, the NYPD's current authorized uniformed strength is 38,422. There are also approximately 4,500 Auxiliary Police Officers, 5,000 School Safety Agents, 2,300 Traffic Enforcement Agents, and 370 Traffic Enforcement Supervisors currently employed by the department. The Police Benevolent Association of the City of New York (NYC PBA), the largest municipal police union in the United States, represents over 50,000 active and retired NYC police officers. The NYPD has a broad array of specialized services, including the Emergency Service Unit, K9, harbor patrol, air support, bomb squad, counter-terrorism, criminal intelligence, anti-gang, anti-organized crime, narcotics, public transportation, and public housing. The NYPD Intelligence Division & Counter-Terrorism Bureau has officers stationed in 11 cities internationally. In the 1990s the department developed a CompStat system of management which has also since been established in other cities. The NYPD has extensive crime scene investigation and laboratory resources, as well as units which assist with computer crime investigations. The NYPD runs a "Real Time Crime Center", essentially a large search engine and data warehouse operated by detectives to assist officers in the field with their investigations. A Domain Awareness System, a joint project of Microsoft and the NYPD, links 6,000 closed-circuit television cameras, license plate readers, and other surveillance devices into an integrated system. Due to its high-profile location in the largest city and media center in the United States, fictionalized versions of the NYPD and its officers have frequently been portrayed in novels, radio, television, motion pictures, and video games. The Municipal Police were established in 1845, replacing an old night watch system. Mayor William Havemeyer shepherded the NYPD together, originating the phrase "New York (City's) Finest." In 1857, it was tumultuously replaced by a Metropolitan force, which abolished the Municipal police. Twentieth-century trends included professionalization and struggles against corruption. Officers begin service with the rank of "probationary police officer," also referred to as "recruit officer". After successful completion of five and a half to six months, sometimes longer of Police Academy training in various academic, physical, and tactical training, officers graduate from the Police Academy. While officially retaining the title of "probationary police officer,"" graduates are referred to as a "police officer," or informally as a "rookie", until they have completed an additional 18 month probationary period. There are three career "tracks" in the NYPD: supervisory, investigative, and specialist. The supervisory track consists of nine sworn titles, referred to as ranks. Promotion to the ranks of sergeant, lieutenant, and captain are made via competitive civil service examinations. After reaching the civil service rank of captain, promotion to the ranks of deputy inspector, inspector, deputy chief, assistant chief, (bureau) chief and chief of department is made at the discretion of the police commissioner. Promotion from the rank of police officer to detective is discretionary by the police commissioner or required by law when the officer has performed eighteen months or more of investigative duty. The entry level appointment to detective is third grade or specialist. The commissioner may grant discretionary grades of second and finally first. These grades offer compensation roughly equivalent to that of supervisors. Specifically, a second grade detective's pay roughly corresponds to a sergeant's and a first grade detective's pay roughly corresponds to a lieutenant's. Detectives are police officers who usually perform investigatory duties but have no official supervisory authority. A "detective first grade" still falls under the command of a sergeant or above. Just like detectives, sergeants and lieutenants can receive pay grade increases within their respective ranks. There are two basic types of detective in the NYPD: "detective-investigators" and "detective-specialists". Detective-investigators are the type most people associate with the term "detective" and are the ones most frequently portrayed on television and in the movies. Most police officers gain their detective title by working in the Narcotics Division of the Detective Bureau. Detectives assigned to squads are co-located within each precinct and are responsible for investigating murders, rapes, robberies, burglaries and other crimes within that precinct's boundaries. Other detective-investigators are assigned to specialized units at either the major command or citywide level, investigating terrorist groups, organized crime, narcotics dealing, extortion, bias crimes, political corruption, kidnappings, major frauds or thefts committed against banks or museums, police corruption, contractor fraud and other complex, politically sensitive or high-profile cases. A squad of detective-investigators is also assigned to each of the city's five district attorneys' offices. Promotion from "police officer" to "detective-investigator" is based on investigative experience. Typically, a police officer who is assigned to investigative work for 18 months will be designated "detective-investigator" and receive the gold shield and pay increase commensurate with that designation. In the recent past, however, there has been controversy over the budget-conscious department compelling police officers to work past the 18 months without receiving the new title. Newly appointed detectives start at "detective third grade," which has a pay rate roughly between that of "police officer" and "sergeant". As they gain seniority and experience, they can be "promoted" to "detective second-grade," which has a pay grade slightly less than sergeants. "Detective first-grade" is an elite designation for the department's most senior and experienced investigators and carries a pay grade slightly less than lieutenants. All these promotions are discretionary on the part of the commissioner and can be revoked if warranted. While senior detectives can give directions to junior detectives in their own squads, not even the most senior detective can lawfully issue orders to even a junior patrol officer. All detective grades still fall under the "chain of command" of the supervisory ranks beginning with "sergeant" through "chief of department". Detectives, like police officers, are eligible to take the promotional civil service exams for entry into the supervisory ranks. While carrying with them increased pay and prestige, none of these detective grades confer on the holder any supervisory authority. Contrary to some media portrayals, there is no specific rank of "detective sergeant" or "detective lieutenant". Lieutenants and Sergeants are assigned to oversee detective squads as supervisors, and are responsible for all investigations. There is a small percentage of lieutenants and sergeants who work as investigative supervisors and are granted the prestigious pay grade designations of "Sergeant—Supervisor Detective Squad" (SDS), or Lieutenant—Commander Detective Squad (CDS) therefore assuming full investigative command responsibility as opposed to operational supervision. Their pay grade rises to an approximate midpoint between their normal rank and the next highest rank's pay grade, and similar to a detective's "grade", is also a discretionary promotion. This pay grade designation is achieved by assignment to investigative units, i.e. Detective Bureau, Internal Affairs Bureau, Counter-Terrorism Bureau, and the Intelligence Bureau. Lieutenants and sergeants in non-investigatory assignments can be designated lieutenant-special assignment or sergeant-special assignment, pay equivalent to their investigative counterparts. "Detective-specialists" are a relatively new designation and one unique to the NYPD. In the 1980s, many detectives resented that some officers were being granted the rank of detective in order to give them increased pay and status, but were not being assigned to investigative duties. Examples included officers assigned as bodyguards and drivers to the mayor, police commissioner and other senior officials. To remedy this situation, the rank of detective-specialist was created. These officers are typically found in specialized units because they possess a unique or esoteric skill the department needs, e.g., crime-scene tech, sharpshooter, bomb technician, scuba instructor, helicopter instructor, sketch artist, etc. Like detective-investigators, detective-specialists start at third-grade and can be promoted to second- or first-grade status. The Department is administered and governed by the Police Commissioner, who is appointed by the mayor. Technically, the commissioner serves a five-year term; as a practical matter, the commissioner serves at the mayor's pleasure. The commissioner in turn appoints numerous deputy commissioners. The commissioner and his subordinate deputies are civilians under an oath of office and are not uniformed members of the force who are sworn officers of the law. Police commissioner who comes up from the uniformed ranks retains that status while serving as police commissioner. This has ramifications for their police pensions and the fact that any police commissioner who is considered sworn does not need a pistol permit to carry a firearm and retains the statutory powers of a police officer. Some police commissioners carry a personal firearm, but they also have a full-time security detail from the police commissioner's squad. A first deputy police commissioner may have a security detail when they act as commissioner or under other circumstances as approved by the police commissioner. These individuals are administrators who supersede the chief of department, and they usually specialize in areas of great importance to the Department, such as counterterrorism, support services, public information, legal matters, intelligence, and information technology. Despite their role, as civilian administrators of the department, deputy commissioners are prohibited from taking operational control of a police situation (the Commissioner and the first deputy commissioner may take control of these situations, however). Within the rank structure, there are also designations, known as "grades", that connote differences in duties, experience, and pay. However, supervisory functions are generally reserved for the rank of sergeant and above. Badges in the New York City Police Department are referred to as "shields" (the traditional term), though not all badge designs are strictly shield-shaped. Every rank has a different badge design (with the exception of "police officer" and "probationary police officer"), and upon change in rank officers receive a new badge. Lower-ranked police officers are identified by their shield numbers, and tax registry number. Lieutenants and above do not have shield numbers and are identified by tax registry number. All sworn members of the NYPD have their ID card photos taken against a red background. Civilian employees of the NYPD have their ID card photos taken against a blue background, signifying that they are not commissioned to carry a firearm. All ID cards have an expiration date. The Chief of Department serves as the senior sworn member of the NYPD. Terence Monahan is the 40th individual to hold the post, which prior to 1987 was known as the chief of operations and before that as chief inspector. The Department is divided into twenty bureaus, which are typically commanded by a uniformed bureau chief (such as the chief of patrol and the chief of housing) or a civilian deputy commissioner (such as the Deputy Commissioner of Information Technology). The bureaus fit under four umbrellas: Patrol, Transit & Housing, Investigative, and Administrative. Bureaus are often subdivided into smaller divisions and units. Patrol Services Bureau Chief of Patrol The Patrol Services Bureau is the largest and most visible bureau in the NYPD, overseeing the majority of the department's uniformed officers on patrol. The bureau is divided into eight borough commands, which are further divided into 77 police precincts. Special Operations Bureau Chief of Special Operations The Special Operations Bureau was created to enhance the department's coordinated response to major events and incidents that require specifically trained and equipped personnel. The bureau oversees the Emergency Service Unit, the Aviation Unit, the Harbor Unit, and the Mounted Unit. The bureau is also responsible for the Strategic Response Group and the Crisis Outreach and Support Unit. Transit Bureau Chief of Transit The Transit Bureau is responsible for the safety and security of the 5.6 million passengers who use the New York City subways each day. Members of the Transit Bureau patrol the subway's 25 lines, 472 stations, and nearly 250 miles of passenger rail line. The bureau comprises 12 transit districts, each located within or adjacent to the subway system, and overseen by three borough commands: Manhattan, Brooklyn, and Bronx/Queens. District personnel are supplemented by members of several specialized units within the Transit Bureau—including three borough Task Forces, Anti-Terrorism Unit, Citywide Vandals Task Force, Canine Unit, Special Projects Unit, and MetroCard Fraud Task Force. Housing Bureau Chief of Housing The Housing Bureau is responsible for the safety of nearly a half-million residents, employees, and visitors in the city's housing developments. The bureau is divided into nine police service areas, which each cover a collection of housing developments. Transportation Bureau Chief of Transportation The Transportation Bureau is responsible for the safety and security of motorists, passengers, pedestrians, and cyclists on the streets and highways throughout New York City and manages traffic control. The bureau oversees the Traffic Management Center, Highway District, Traffic Operations District, and Traffic Enforcement District, in addition to several units. Counterterrorism Bureau Chief of Counterterrorism The NYPD Counterterrorism Bureau (CT) is the city's primary local resource to guard against the threat of international and domestic terrorism in New York City. The bureau contains the Critical Response Command, Counterterrorism Division, Terrorism Threat Analysis Group, Lower Manhattan Security Initiative, and World Trade Center Command. Crime Control Strategies Bureau Chief of Crime Control Strategies The Office of Crime Control Strategies analyzes and monitors trends across the city and develops strategies targeted to reducing crime, ensuring that these strategies are applied across all units of the NYPD. The bureau is divided into the CompStat Unit and Crime Analysis Unit. Detective Bureau Chief of Detectives The Detective Bureau is responsible for the prevention, detection, and investigation of crime, and its work often complements the work of police officers assigned to the precincts. The bureau oversees the Borough Investigative Commands, Special Victims Division, Forensic Investigations Division, Special Investigations Division, Criminal Enterprise Division, Fugitive Enforcement Division, Real Time Crime Center, District Attorneys Squad, Grand Larceny Division, Gun Violence Suppression Division, and Vice Enforcement Division. Intelligence Bureau Chief of Intelligence The mission of the NYPD Intelligence Bureau is to detect and disrupt criminal and terrorist activity through the use of intelligence-led policing. NYPD Intelligence operations are divided by functional responsibility: Intelligence Operations and Analysis Section (IOAS) and the Criminal Intelligence Section (CIS). Administration Deputy Commissioner of Administration The Office of the Deputy Commissioner, Administration (DCA), was created in early 2014 and acts as the liaison to the department's fraternal, religious, and line organizations. DCA oversees the Employee Relations Section, the Chaplains Unit, and the Ceremonial Unit. Community Affairs Bureau Chief of Community Affairs The Community Affairs Bureau (CAB) partners with community leaders, civic organizations, block associations, and concerned citizens to educate them on police policies and practices. The Community Affairs Bureau oversees four divisions: Community Outreach Division, Crime Prevention Division, Juvenile Justice Division, and School Safety Division. Information Technology Bureau Deputy Commissioner of Information Technology The Information Technology Bureau (ITB) develops and implements technology to support strategies, programs and procedures that promote safety, efficiency, and effectiveness. ITB has six divisions: Administration, Fiscal Affairs, Strategic Technology, IT Services Division, Life-Safety Systems, and the Communications Division. Legal Matters Deputy Commissioner of Legal Matters The NYPD Legal Bureau provides assistance to law enforcement personnel regarding department legal matters. The Legal Bureau also has a memorandum of understanding with the Manhattan DA to selectively prosecute New York City Criminal Court summons court cases. The bureau comprises the Civil Enforcement Unit, Criminal Section, Civil Section, Legislative Affairs Unit, Document Production/FOIL, and the Police Action Litigation Section (PALS). Personnel Chief of Personnel The Personnel Bureau is responsible for the recruitment and selection of personnel and for managing the human resource functions of the NYPD. The bureau oversees the Candidate Assessment Division, Career Enhancement Division, Employee Management Division, Personnel Orders Section, and Staff Services Section. Support Services Bureau Deputy Commissioner of Support Services While the bureau handles a wide range of equipment and storage-related functions, the bulk of its operations center on the NYPD's vehicle fleet and its evidence warehouses. The Support Services Bureau oversees the Fleet Services Division, Property Clerk Division, Central Records Division, and the Printing Section. Training Bureau Chief of Training The NYPD Training Bureau provides recruits, uniformed officers, and civilians with academic, tactical, and technological information. The Training Bureau's training section includes: Recruit Training Section, Physical Training and Tactics Department, Tactical Training Unit, Firearms and Tactics Section, COBRA Training, In-Service Tactical Training Unit, Driver Education and Training Unit, Computer Training Unit, Civilian Training Program, School Safety Training Unit, Instructor Development Unit, Criminal Investigation Course, Leadership Development Section, and Citizens Police Academy. In August 2008, the Lower Manhattan Security Initiative in a partnership between the New York City Police Department and Microsoft began the Domain Awareness System to monitor New York City. The program allowed the department to track surveillance targets and gain detailed information about them. The system is connected to 6,000 video cameras around New York City as well as check radiological and nuclear detectors onboard helicopters, trucks and boats as well as detectors on police officers' gun belts that were so sensitive that people who have had medical procedures may trigger them. Lower Manhattan now includes thousands of surveillance cameras that can identify shapes and sizes of unidentified "suspicious" packages and can track people within seconds using descriptions such as "someone wearing a red shirt". In 2009, an extension into Midtown Manhattan was announced and by 2012 the program was fully implemented. The system was also licensed out to other cities with New York City getting 30% of the profits. The system's development costs were estimated at US$40 million. This system was highlighted in a May 2013 episode of PBS' Nova on tracking the Boston Marathon Bombers. As of the end of 2010, 53% of the entire 34,526-member police force were white and 47% were members of minority groups. Of 22,199 officers on patrol, 53% (11,717) were black, Latino (of any race), or Asian or Asian-American, and 47% (10,482) were non-Hispanic white. Of 5,177 detectives, 57% (2,953) were white and 43% (2,225) were people of color. Of 4,639 sergeants, 61% (2,841) were white and 39% (1,798) were minorities. Of 1,742 lieutenants, 76% (1,323) were white and 24% (419) were people of color. Of 432 captains, 82% (356) were white and 18% (76) were minorities. Of 10 chiefs, 7 were white and 3 were people of color. In 2002, whites accounted for 60% of members in the rank of police officer. Between 2002 and 2010, the number of minorities in top-tier positions in the force increased by about 4.5%. The Civilian Complaint Review Board is an all-civilian, 13-member panel tasked with investigating misconduct or lesser abuse accusations against NYPD officers, including use of excessive force, abuse of authority, discourtesy and offensive language. Complaints against officers may be filed online, by mail, by phone or in person at any NYPD station. The NYPD is affiliated with the New York City Police Foundation and the New York City Police Museum. It also runs a Youth Police academy to provide positive interaction with police officers and to educate young people about the challenges and responsibility of police work. The department also provides a citizen Police Academy which educates the public on basic law and policing procedures. According to the Officer Down Memorial Page, the NYPD has lost 930 officers in the line of duty since 1849. This figure includes officers from agencies that were later absorbed by or became a part of the modern NYPD in addition to the NYPD itself. This number also includes officers killed on and off duty by gunfire of other officers on duty. The NYPD lost 23 officers in the September 11, 2001 attacks, not including another 135 who died of illnesses related to the attacks. The current colors of NYPD vehicles is an all-white body with two blue stripes along each side. The word "POLICE" is printed in small text above the front wheel wells, and as "NYPD Police" above the front grille. The NYPD patch is emblazoned on both sides, either on or just forward of the front doors. The letters "NYPD" are printed in blue Rockwell Extra Bold font on the front doors, and the NYPD motto "Courtesy, Professionalism, Respect" is printed on the rear ones. The unit's shop number is printed on the rear decklid. The shop number is also printed on the rear side panels above the gas intake, along with the number of the unit's assigned precinct. A modified paint scheme, with dark blue (or black, for some Auxiliary units) body and white stripes on the sides was used for some divisions. The text was also white. This was phased out in favor of a modified version of the regular scheme, with the word(s) "AUXILIARY", "SCHOOL SAFETY" or "TRAFFIC" on the rear quarter panels and trunk. New NYPD officers are allowed to choose from one of three 9mm service pistols: the SIG Sauer P226 DAO, Glock 17 Gen4, and Glock 19 Gen3. All duty handguns are modified to a 12-pound (53 N) NY-2 trigger pull. The Smith & Wesson 5946 was initially issued to new recruits; however, the manufacturer stopped producing the weapon. It is no longer an option for new hires, though officers who currently utilize the weapon are grandfathered in and may continue to use it. After the switch in 1994 to semiautomatic pistols, officers who privately purchased revolvers before January 1, 1994, were allowed to use them for duty use until August 31, 2018. They were then grandfathered in as approved off-duty guns. Shotgun-certified officers were authorized to carry Ithaca 37 shotguns, which are being phased out in favor of the newer Mossberg 590. Officers and detectives belonging to the NYPD's Emergency Service Unit, Counter-terrorism Bureau and Strategic Response Group are armed with a range of select-fire weapons and long guns, such as the Colt M4A1 carbine and similar-pattern Colt AR-15 rifles, Heckler & Koch MP5 submachine gun, and the Remington Model 700 bolt-action rifle. The firearms approved by the NYPD for off duty carry are the Glock 26, Smith & Wesson 3914 DAO, Smith & Wesson 3953TSW, Smith & Wesson Model 640 (.38 revolver), SIG Sauer P239 DAO, Springfield XDS, Smith & Wesson M&P Shield and the Beretta 8000D Mini Cougar. From 1926 until 1986 the standard weapons of the department were the Smith & Wesson Model 10 and the Colt Official Police .38 Special revolvers with four-inch barrels. Female officers had the option to choose to carry a three-inch barrel revolver instead of the normal four inch model due to its lighter weight. Prior to 1994 the standard weapon of the NYPD was the Smith & Wesson Model 64 DAO (Double Action Only) .38 Special revolver with a three or four inch barrel. This type of revolver was called the Model NY-1 by the department. Prior to the issuing of the 9mm semi-automatic pistol NYPD detectives and plainclothes officers often carried the Colt Detective Special and/or the Smith & Wesson Model 36 "Chief's Special" .38 Special caliber snub-nosed (2-inch) barrel revolvers for their ease of concealment while dressed in civilian clothes. The Kahr K9 9 mm pistol was an approved off-duty/backup weapon from 1998 to 2011. It was pulled from service because it could not be modified to a 12-pound trigger pull. ^ "Annual Estimates of the Resident Population: April 1, 2010 to July 1, 2015 – 2015 Population Estimates – New York". United States Census Bureau. Retrieved January 15, 2017. ^ a b "About NYPD - NYPD". www1.nyc.gov. Retrieved 6 April 2019. ^ "Commissioner James P. O'Neill". New York City Police Department. Retrieved 26 April 2018. ^ "Chief of Department Terence Monahan". New York City Police Department. Retrieved April 26, 2018. ^ "Fleet Report - Mayor's Office of Operations". www1.nyc.gov. ^ "Bureau of Justice Statistics - Appendix table 1" (PDF). United States Department of Justice. p. 34. Retrieved December 5, 2013. ^ "Property Clerk". New York City Police Department. February 16, 2011. Retrieved September 27, 2013. ^ Myers, Steven Lee. "Giuliani Wins Police Merger in M.T.A. Vote". ^ "Fiscal 2018 Preliminary Budget for the New York Police Department" (PDF). New York City Council. Retrieved August 19, 2018. ^ "Document shows NYPD eyed Shiites based on religion". Associated Press. Retrieved September 27, 2013. ^ Hartmann, Margaret (January 27, 2012). "NYPD Now Has an Israel Branch". New York. Retrieved September 27, 2013. ^ "NYPD launches new all-seeing 'Domestic Awareness System'". RT. July 30, 2012. Archived from the original on August 11, 2012. ^ "NYPD - Administration". nyc.gov. Archived from the original on 2016-09-20. ^ "Bureaus". New York Police Department. Retrieved 18 May 2017. ^ "News from the Blue Room". The City of New York. Office of the Mayor. 8 August 2012. Retrieved 6 April 2015. ^ "NYPD expands surveillance net to fight crime as well as terrorism". Reuters. June 21, 2013. Retrieved October 31, 2015. ^ ""Ring of Steel" Coming to Midtown". WNYC. 4 October 2009. Retrieved 6 April 2015. ^ Ungerleider, Neal (August 8, 2012). "NYPD, Microsoft Launch All-Seeing "Domain Awareness System" With Real-Time CCTV, License Plate Monitoring [Updated]". Fast Company. Retrieved 19 June 2013. ^ Long, Colleen (February 20, 2013). "NYPD, Microsoft Create Crime-Fighting 'Domain Awareness' Tech System". Associated Press. Archived from the original on February 24, 2013. Retrieved 19 June 2013. ^ "Manhunt—Boston Bombers" (Video). NOVA. PBS. 29 May 2013. Retrieved 6 April 2015. ^ El-Ghobashy, Tamer (January 7, 2011). "Minorities Gain in NYPD Ranks". Wall Street Journal. Retrieved May 8, 2012. ^ "NYC Civilian Complaint Review Board". nyc.gov. nyc.gov. Retrieved 2015-03-28. ^ "The Officer Down Memorial Page". ^ a b "NYPD Set to Retire Last of its Revolvers - The Firearm Blog". 30 November 2017. ^ Massad Ayoob (December 1999). "Trendy Guns Don't Sell Like the Classics". Shooting Industry. ^ "Training Bureau | Firearms & Tactics Section". nyc.gov. Archived from the original on March 12, 2009. ^ "Guide to Smith & Wesson Semi-Auto Pistols & Their Model Numbers". www.luckygunner.com. ^ "NYPD's Elite E-Men". Tactical Life. Retrieved 26 July 2014. Darien, Andrew T. Becoming New York's Finest: Race, Gender, and the Integration of the NYPD, 1935–1980. New York: Palgrave Macmillan, 2013. Richardson, James F. "To Control the City: The New York Police in Historical Perspective". In Cities in American History, eds. Kenneth T. Jackson and Stanley K. Schultz (1972) pp. 3–13. Thale, Christopher. "The Informal World of Police Patrol: New York City in the Early Twentieth Century", Journal of Urban History (2007) 33#2 pp. 183–216. 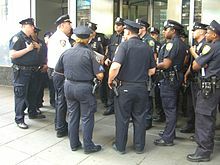 Wikimedia Commons has media related to New York City Police Department. "New York City Police Department collected news and commentary". The New York Times. Google (2015-01-17). "Map of NYC Law Enforcement Line of Duty Deaths" (Map). Google Maps. Google. Retrieved 2015-01-17.